One of the largest spenders in Indian Premier League (IPL) this season, VIVO is using the platform to increase its visibility among their target audience. 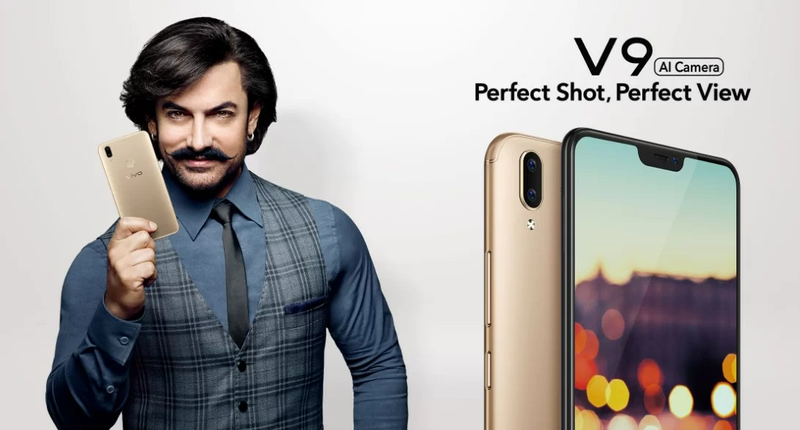 Alongside roping in Aamir Khan as their brand ambassador, the Chinese handset maker is running massive campaigns around the league to promote its flagship smartphone, Vivo V9. Vivo entered the notch trend with the Vivo V9 that launched in March 2018. Just like most of its smartphones, this one comes with a stunning selfie camera and a bunch of other good features. Let’s see more about it in detail. This phone is just as compact as a standard 5.5-inch phone, but it offers a wonderful viewing experience, thanks to the presence of its 1.75 mm side bezel. There’s more in store for you, as the 19:9 FullView Display of V9 has a 90% screen-to-body ratio, making every visual look bigger and brighter. A smooth and lag-free performance is what this phone has to offer, thanks to its 14nm Qualcomm Snapdragon 626 Octa-core processor and 4 GB of RAM. Internal memory too, wouldn’t be a problem as it comes with 64 GB of ROM which is expandable up to an additional 256 GB. This phone comes equipped with the Android Oreo 8.1 operating system for longer battery life and improved security. AI Face Beauty, AI Selfie Lighting, AI Bokeh Effect and AI HDR – this phone has several features that make use of the Artificial Intelligence Technology.